How do we do this? There are the rehearsals of course, each of which is a demanding 90 minutes of focused concentration. This is where an 8 year old begins his tenure in the choir, taught by music experts who understand the learning styles that are unique to boys. He will tackle all the elements of music (rhythm, melody and harmony) and how to sing and how to blend as one voice. But this is only the “visible” part of the program. Building anything of value takes time, attention to detail, opportunity and experience. 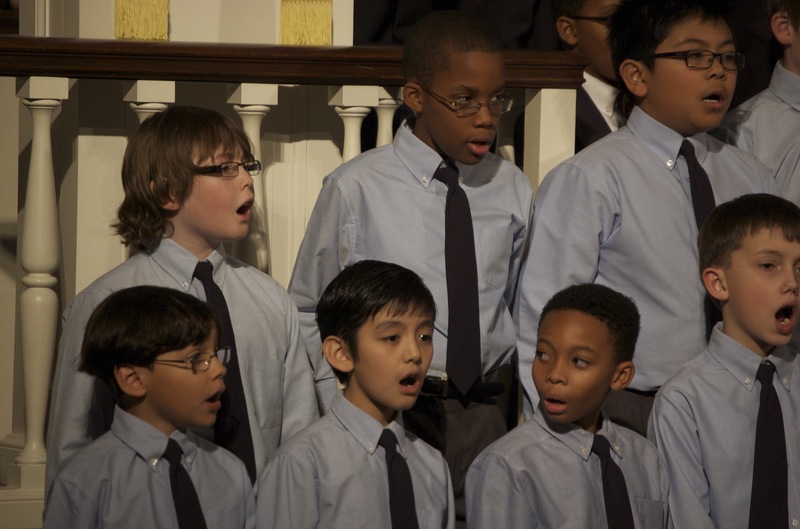 At Houston Boychoir we offer those opportunities and experiences. Most recently boys attended Houston Grand Opera’s production of Carousel at the Wortham Theater Center. Here they experienced great singing, high quality production and the opportunity to interact with Houstonians who care about the arts. 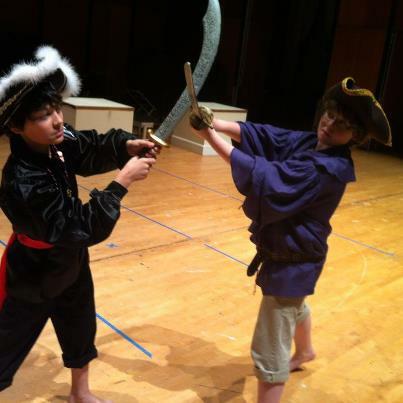 Boys dressed up for the theater and conducted themselves as gentlemen do. 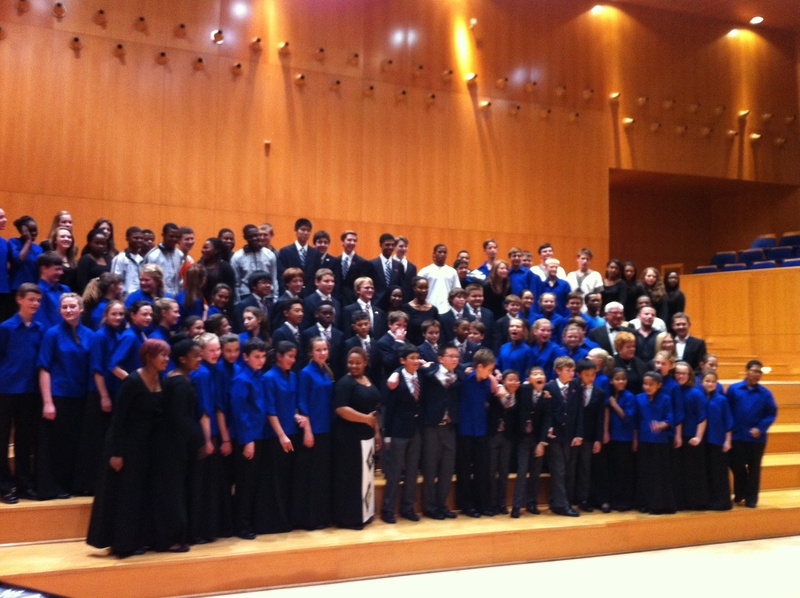 On the first Saturday in May our Preparatory Choir took their annual Day Tour. On this trip they sang at a retirement community and witnessed how their gifts of music impacted others on a personal level. From there, they stopped in Galveston at The Children’s Center, a place that operates to serve the homeless, the neglected, the abandoned, the abused or forgotten. They sang yes, but they have also spent weeks collecting gift cards, diapers, clothing, personal hygiene products, school supplies and more. Through this experience these boys they experienced the joy of giving as well as gained a deeper appreciation for their life circumstances. These were two completely different experiences, each one designed to influence various aspects of the life of a man of character. I invite you to join us in our mission. You can volunteer, you can donate or perhaps you know of a boy who could benefit from a program such as this. The Houston Boychoir, it will change your life! Visit our website and see how to audition. Young men with a mission. He might be 8 years old or he might be 18, but every day he gets up and goes to school and then, 1 or 2 days a week after school he attends choir rehearsal where he learns the art of self discipline, of mental gymnastics, of precision to detail, of nuance of language (both his own and foreign tongue), and of the physical stamina required to stand for long hours of rehearsal. He develops drive and the ambition to be better than he is. He learns how to be a team member, how to support his fellow choristers by knowing his part and by knowing what he is a part of. He learns how to take direction and he learns how to ask questions. In addition to all of this, the boy gives up one Saturday a month to continue to add to his understanding of music, of teamwork and of himself. He must maintain excellence in all things: his grades, his conduct and his health. Then, come late November and December his schedule becomes the battlefield. He will participate in up to 20 performances, he will still have to take final exams or end of course work and when school is over and the concerts are done, he will take one more day to give to his community by spending 8 hours in the Houston Medical Center to give the gift of his music for patients, families, doctors, nurses and all hospital support staff. In a few days these boys will begin the process again. They will happily come to rehearsal eager to see what new adventures will lie before them, adventures in music, in friendship, and in the journey we call life. These are our future parents, educators, and leaders. We salute you singing boys everywhere! If you live outside the 610 Loop or north of Westheimer or 290 or I10, you will find our West Campus most convenient. It is a great place for multi tasking. Run errands while your son is rehearsing or add steps to your Fitbit mall walking! We share our beautiful space with the Virtuosi of Houston Studio. Or you might find our Central Campus more convenient. In the heart of the city, it is located adjacent to Rice University and the West University Village at Christ the King Lutheran Church. The area is rich with opportunity. Which ever campus you attend, our directors are top notch, the best in the field of elementary music and specialists working with young boys. You will find that when your son is engaged in singing, he is a healthier, happier boy and who doesn’t want that! 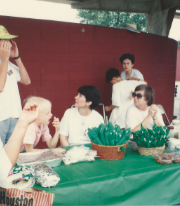 Our parents involved at our boychoir picnic! One of the most valuable resources in our organization is- hands down our parents! Without parental input and support we would never be able to run a successful choir and help create responsible men out of the boys who come to us. At Houston Boychoir we know and appreciate the value of our parent volunteers. They are awesome caring people who have a multitude of talents that include: sewing, photography, writing, art design, costuming, marketing, video, sales, organizational skills, accounting and book-keeping, cooking, nursing, event planning, communications, design, business, musical skills, sales, computer skills, and so much more. Parents provide the backbone to our community and it can frequently be seen in the success of the boys whose parents are involved most! But now, scientific studies prove that parental involvement is beneficial to the child, to the parents and to the entire family. Our parent fetching water for boys! 2. By being more involved in these programs, parents are more able to monitor their child’s progress and have regular correspondence with the teachers to ensure their child is receiving the right attention for his specific needs. 3. Parents are also educated about the specialized activity their child is involved in, which in our case, is being in a choir and singing. Parent’s musical knowledge and ability can even be built up as they become more involved in what their child is doing. 4. Parents involvement also makes it possible for the organization to do more with less. When parents volunteer less money is spent on staff and more resources are available in direct programming for boys, allowing provision for as many learning opportunities as possible. Parents getting together to plan future meals. 5. Parents involvement can also support more positive parent-child relationships at home (Priscilla Little, Research and Strategy Consultant). Children feel more encouraged when they can see their parents involved in the after-school program, and can go home and discuss it with their parent. So here’s to our parents, we salute you! Preparing for 30 to hit the trail for a concert tour is a bit like packing up a three-ring circus. In one ring you have boys: energetic, enthusiastic, enigmatic, ever-loving, voice changing boys!! In one ring you have stuff: med forms, snacks, props and costumes, gifts and cards, first aid, kit, water, extra music, notes, notes and notes about where to go and what to do and of course, lists!! In the third ring you have the adventure waiting to happen: friends to meet, concerts to sing, sites to see and memories to make. In the morning bright and early we will hit the road. Mr. Fowler surveys the playing field.Going Deep.The Winner! 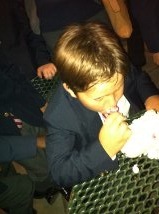 You can imagine that with 50 years of singing boys, there are many traditions in Houston Boychoir. 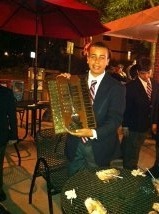 The most honorable award is the Singing Boy of the year, but my personal favorite is the Spoon Award. One of the fun things about being in Houston Boychoir [are] that we have many opportunities to eat out; that is where the Spoon Award comes in. In order to win this award you have to eat every thing on your plate and be neat, (or as Mr. Fowler is quick to remind us, ” it is quantity and quality”) but the spoon is always watching! 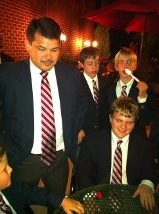 In my 2 years of going on tour with HBC, after our formal dinner we’ve always gone to get ice cream. 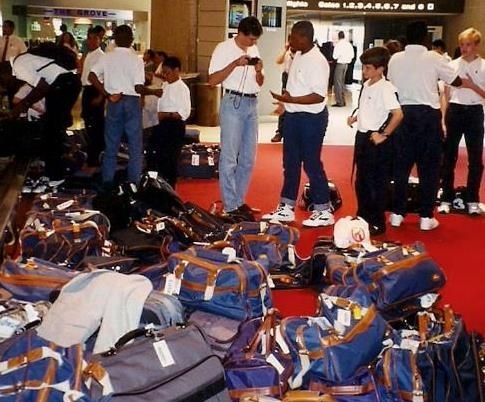 Every boy gets whatever he wants and then the 4 boys, that have been neat and have eaten every thing on their plate, year round, are chosen to participate in the competition. At the competition Mr. Fowler orders a lot of ice cream. The four boys sit at a table with the ice cream. They have a specified limit to eat but, there’s one more twist, you don’t get to eat with regular utensils, you must eat with an item that has something to do with tour (this year it was a miniature minor’s hat keyring or it could be a guitar pick like the year we were in Nashville). Eventually after all that, the boys start eating. When the time limit ends they are judged on neatness and amount eaten. Who ever wins gets the special spoon for the year and his name on a plaque. If the same person gets it for 3 years the spoon is retired. Once In Royal David’s City, a traditional solo for a boy to sing during the Christmas season. 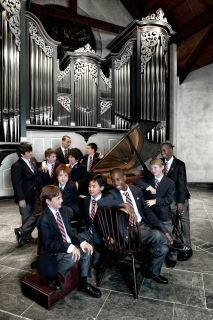 Houston Boychoir featured two boys at St. Martin’s Episcopal Church in Houston. St. Martin’s is the largest Episcopal Parish in the United States and the architecture is that of a gothic cathedral in the french style. It is a magnificent building to the glory of God. Until you put them in an environment of adult musicians and ask them to respond accordingly…and they do. They read music with the best of them, and they can adapt to new situations with the flash of a simple instruction. They stand like pros with not a hint of nervousness. They are truly amazing. They make me so proud and assure me that what I have been called to do is the right thing. The right thing for me, for them, for their parents and for our future world together. How lucky I was to be called to this work, how fortunate indeed that I have been fulfilled in my love of music from childhood. If you are reading this and you are the parent of a youngster, get them enrolled in music as fast as you can. Not to study music with the intent of making it their life work or becoming great artists. Obviously society would be in trouble if everyone wanted only to be a great musician. But, studies have been done for some time now on basic intelligence as it relates to learning music and every child if given the opportunity will benefit in scores of ways from music. Music is mathematic in its rhythmic aspects. Time is precisely subdivided into fractions which must be figured out on the spot from the musical notation. And they have to do it in their head, there is not time to work it out on paper. Music teaches scientific principles of acoustics including sound intensity, tone quality, volume changes, melody and harmony. each of these is related to its aesthetic implications. through learning to tune and handle their instruments or voices, children can learn about harmonic vibrations and overtones. They learn that the faster the vibration, the higher the pitch and the slower the vibration the lower the pitch and what sort of energy does it need to make that vibration at exactly the right speed and intensity. Music teaches foreign language. Terms in French, Italian and German tell us that there are many ways of saying the same thing. Songs learned in foreign languages help accustom the child to the words and sounds of the language. Text is more easily remembered when set to music. It is truly the universal language. Music teaches history, Each of the recorded periods of human history has had a musical counterpart. The music of each period expresses the times of which it is born. Music teaches geography and understanding of different cultures. The nature, the emotional makeup of a people is expressed in its music. we learn specific feelings about a nationality as they are put forth by its composers, who often incorporate existing folk musical idioms in their music to create a nationalistic sense. Physically, the study of music requires muscular coordination, agility and motor control. Muscles of the hands, fingers, face and diaphragm must work together with perfect timing. Kinesthetic senses develop as they relate to the sound that the ear hears and the mind interprets. Music is art because it is human expression. It is a medium through which man can express beauty. Great music from all eras is great because it has power to humanize mankind. It teaches us to be more feeling and sensitive. It can take away depression. It can provide impetus for action. It can poetically describe all ranges of human emotion. It can soothe troubled nerves or bring light into a dark world. It can bless us with precious humor and increase our understanding of beauty, of compassion, of gentleness, of goodness and of life. It can inspire men and women to good deeds and bring them closer to an infinite beyond this world. Musical training cultivates musical taste. If children are not exposed to music of the masters, there is no reason to assume that they will choose to listen to it. What’s more, it is the music that the children make themselves that has the greatest impact on them. For a youngster, being in the heart of the group, the choir or orchestra, is many times more rewarding than listening to the same music performed by someone else. Children who have a taste for a broad range of the great music will still enjoy what is popular, but they also know something greater! So as I wish you all a happy New Year and I thank you for the privilege of working with your sons I congratulate you on having the foresight and the fortitude to stick with these extracurricular demands placed on you, on your children and on your family. It is worth it for your son and for the world in which we live.